2014 WINTERNSHIP BLOG by Kirsten Pope, a participant in last years program. Very nice, with lots of pictures. Oh, yes….lots of snow ! Lots of snow – feet of snow – never ending snow ! Shovel, push peoples cars out, deal with getting from one building to another ! Zack gets stuck in Cleveland 3 days. Christina Keegan, a natural builder, puts him up. 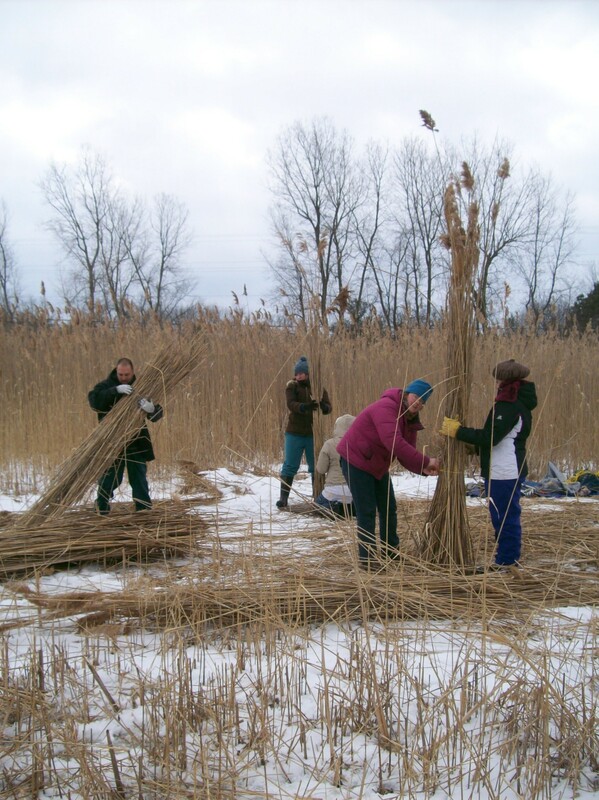 Harvest Reed Grass for thatching – cut, bundle, transport and learn to apply to a roof. ROUND POLE WORKSHOP mini & full workshop led by Mark Angelini and Deanne. ROCKET STOVE WORKSHOP Principles of the stove, and mockup of the combustion unit. EARTH PLASTER and SCULPTING WORKSHOP. 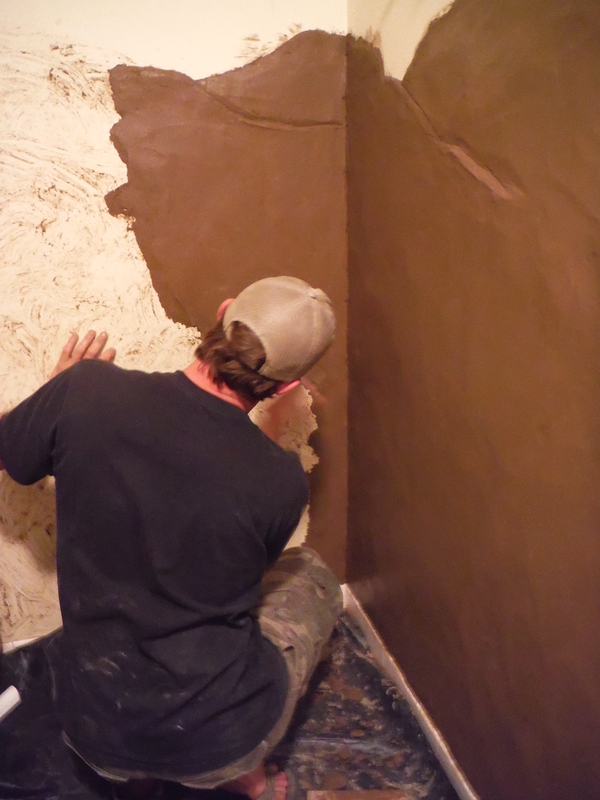 How to mix & apply to existing walls. Round Pole Thatching Frame – harvested poles, lashed and constructed, then thatched it. 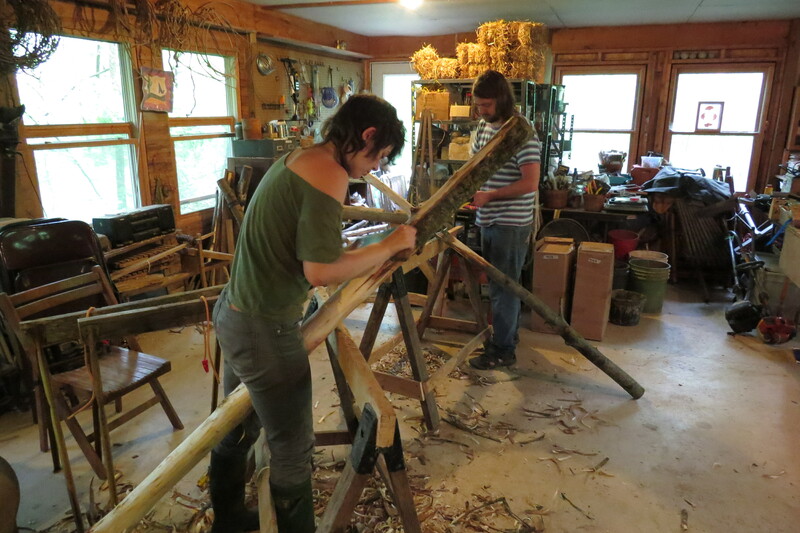 Round Pole Sawhorses – Research design and construct a set of using lashing techniques. Stabilize dimensional sawhorses. Round Pole Fairy Forest Frame partially constructed. All timbers prepared. Earth Plaster retrofit in the East Wing. Help design, construct, teach. Living skills use hay box cooking, make fruit scrap vinegar, sauerkraut, sour dough & injira flat bread wraps, lashing, research cooking beans. Yogurt making. Rocket Stove – fire up and use, regularly. Composting: worm composting, outdoor regular compost and humanure compost. Cook on the Rocket Stove Cooker. Mushroom logs, brought in, soaked, fruited, photographed, cooked up and eaten ! Wood skills: Harvest timbers for the round pole projects. Learn to fell trees. Identify sizes and shapes for the project, label, Sned poles with hatchet, chisel and saw, debark with a drawknife. Use a shaving horse to make pins. Learn and use several Lashing knots. Carve notches and joints with chisel and saws: saddle joint, lap joint. Stabilize logs for notching. Plaster & Sculpture skills: Make starch paste, make & apply Adhesion Coat, mix and apply Finish Earth Plaster and Cob. Assess soil components, understand sand and clay for structure and stickiness in the mix, fiber for tensile strength, starch paste additive as a hardener (in finish plaster). Construct necessary armature/attachment to wall for a small sculptures (sconce). Sculpt details – vines & leaves. Finishes – do a hard troweled and sponge finish. Winterns co-designed the Earth Plaster Project in the East Wing. Scott did modeling. Natural Paints and Oils: We made natural dyes with walnut hull, acorn, coffee, tea. milk paint, egg shell additive, applied above to the East Wing Bathroom Floor in a pattern to hide future distress to the floor, oiled the floor and Strawbale Earthen Bench with Hemp Seed Oil. Classroom Presentations: Foundations, Framing, Floor, Retrofit, Design & solar. Permaculture Presentation and walk with Jared Bogdonove-Hanna. Pizza supper. Conversations: economic conversation and so many more. Get sawdust from Pipeline for composting, protected the timber frame logs. Bookcase cleared in East Wing, TV pushed into bookcase, walls earth plastered! Organize & clean the Red Shed. Tools from the Identity Cabin to the Red Shed. Keep the house clean and neat ! Wood harvest and stacking for Rocket Stove. Worm compost. Oiled bathroom floor and Strawbale Earthen Bench. Guests and networking: People come by and there are networking conversations. Michigan Folk School people, others. Krystal and daughter Phoenix – for several days. Folks from Frog Holler stay overnight. Wendy, Ethan and puppy. Brooke VanDyke and Steven Middendorp came to all workshops & stayed overnight. 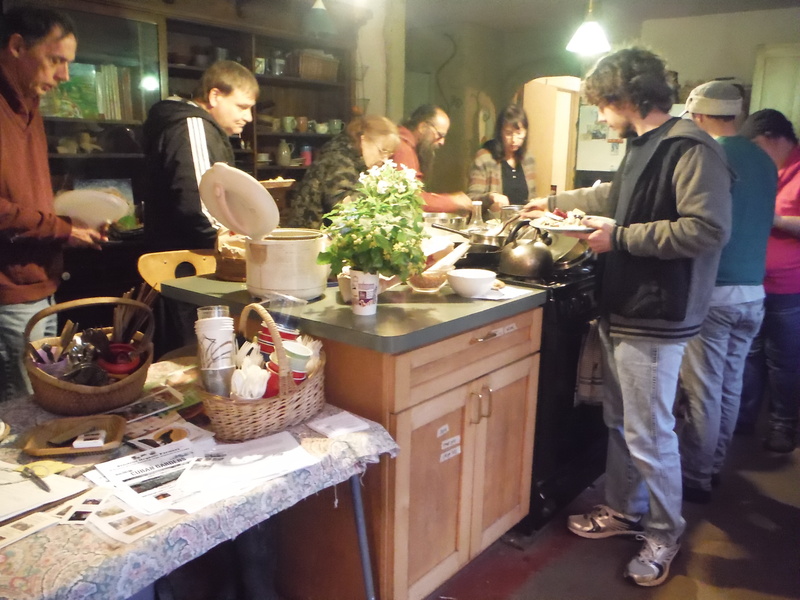 Full Moon Potluck & Bonfire at the Strawbale Studio – help prep and take part in. Entertainment and sharing: Acroyoga, Juggling, Card Tricks (Magic, of course), Treehouse video, The Lorax movie, Alone in the Wilderness movie, Mud, Hands, a House video. Days Off – excursions: to Lake Huron, Detroit dance party, Ben walks back to the swamp and photographs living and dying tadpoles in the icy water. Scott goes to Ann Arbor to do Performance Arts. 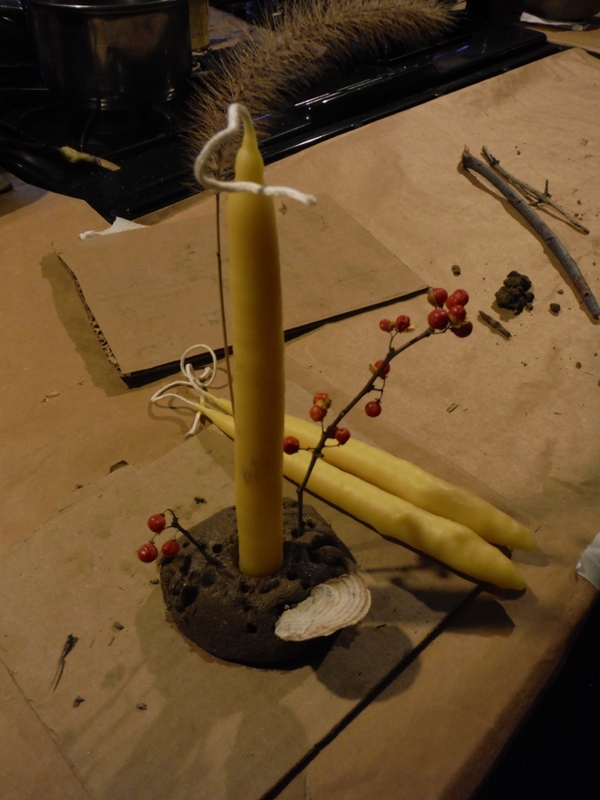 Sustainable Living Skills: Candlemaking Day with Deanne, Liquid Soap-making with Jimez. Day 1 (Sunday 5th) Arrive–Jimez and Kirstin arrive. Day 2 (Monday 6th) Research & design round pole sawhorse, hay box, fruit scrap vinegar, research bean cooking, lashing. Snow. Day 3 (Tuesday 7th) Harvest 2 poles, snedded, debarked with drawknife, manilla rope, DB drawings for Mark for workshop. Green egg omelet. Shovel snow off the house parking lot. Snow. Day 4 (Wednesday 8th) Scott and Zack arrive. Harvest and cut sawhorse poles, mushroom log soaking. DB call re refinancing, re participants, re plumbing repair on frozen kitchen pipe at Green Lake. Bird suet out. Cooking. PERMACULTURE Meetup ! Hickory nuts. Day 5 (Thursday 9th) Economic conversation, Ben arrives, cut and lashed round pole sawhorse, harvested poles, tarps on the timber frame wood in pipeline, rebundled reed. Sauerkraut started. Day 6 (Friday 10th) Prepared for workshop. 2 trees cut, cut bent, label poles, debark. Cleaned and organized Red Shed. Identity cabin tools in. Dimensional sawhorse stabilized. 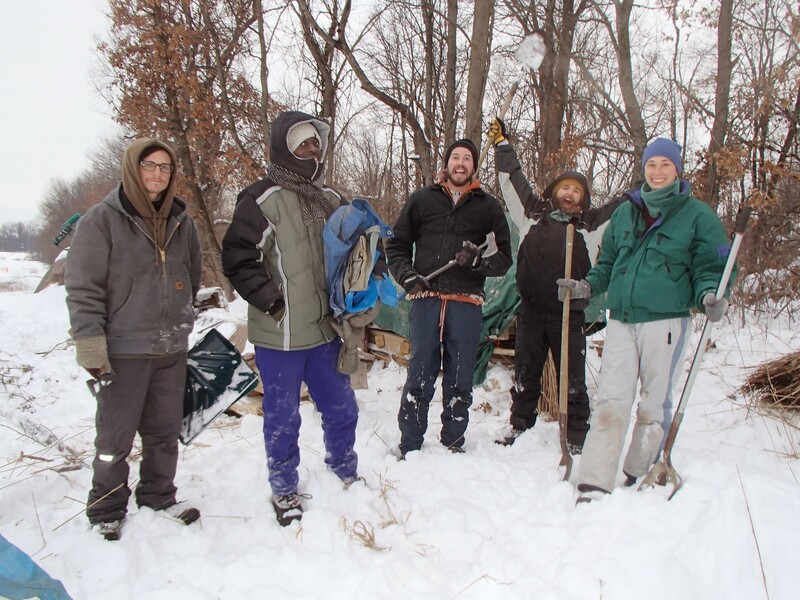 Harvested poles, fire up rocket stove, shaving horse, collect tools, butternut squash soup. DB drawing and handouts, cut and marked trees. Mushroom logs stood on end. Day 7 (Saturday 11th) Workshop cancelled due to completely icy weather. Mark goes back home, gets stuck on the way home. 3 people still show up. Networking in the main house, Round Pole mini workshop led in the Red Shed by Deanne. Principles, reading a log, cut one notch. Magic trick day, Acroyoga pm. Day 8 (Sunday 12th) Day off. Shrimp breakfast with Krystal. Ben photographs tadpoles living and dying in the swap. Non-violent communication/‘being the change’ discussions. Scott left for A2 for a gig. Evening hang out, cards, etc. Lots of sleep. Day 9 (Monday 13th) Model of Round Pole structure, intro to the course, vegetable stock. Music and cooking as group, baba ghanough dinner, strained fruit scrap vinegar. Day 10 (Tuesday 14th) Gourmet breakfast.Meeting at 10:30am. Talk about start, handouts sheets. Sawdust from pipeline for composting toilet. 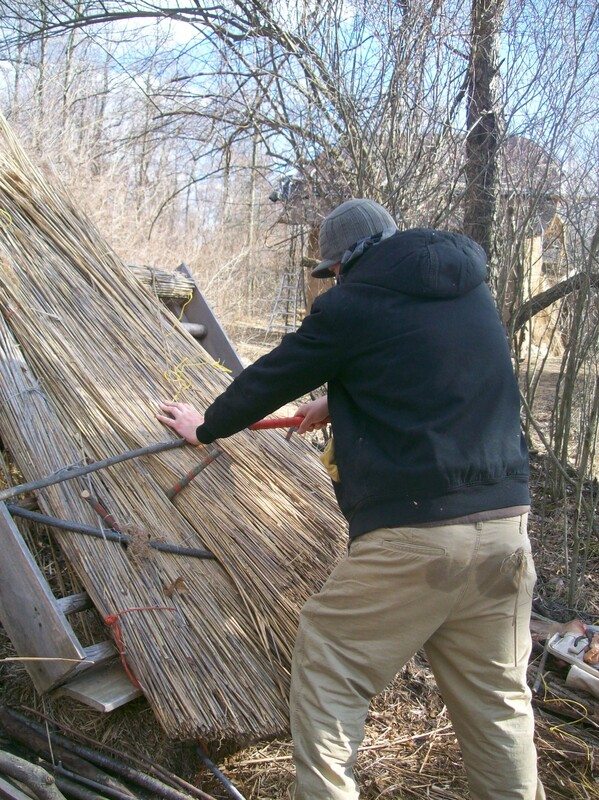 Started earth oven/firepit wood shelter–for thatching course. Sawhorse work. Started organizing timber for round pole class. Yoga with group, food shopping, eggs, soup. 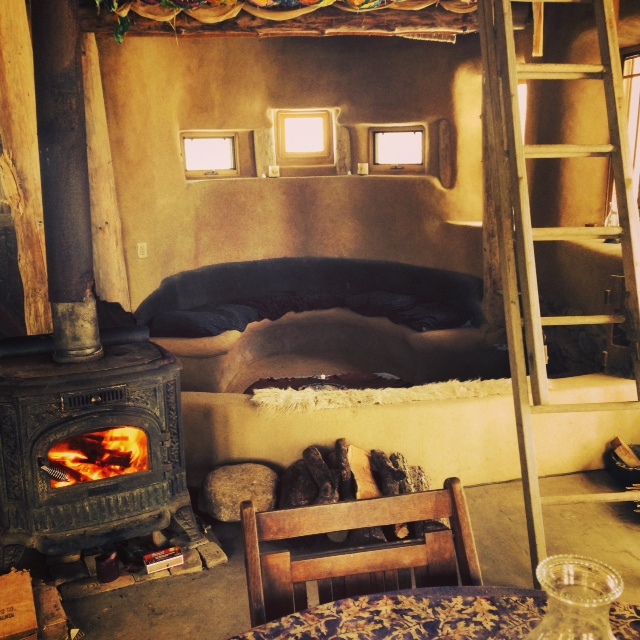 Strawbale Studio – fire going. Day 11 (Wednesday 15th) POTLUCK DAY Debarking, bulk food ordered, sawhorse completed, thatch frame completed. Worked on identifying timber for workshop, shoveled fire pit, prep for full moon, potluck food. Don plowed the driveway and Winterns helped. Prepared for the potluck, getting together the wood for 3 fires….Strawbale Studio woodstove, the bonfire and the Rocket Stove. Guests from Frog Holler. Day 12 (Thursday 16th) Day off. Pancake breakfast. Frog Holler stayed overnight, and played trivia game, watched the treehouse video, the Lorax. Day 13 (Friday 17th) Reed collection/powerline down. Skinned poles, handout / poster workshop prep, clean/ organize/ wood for the workshop. Day 16 (Monday 20th) Day off – folks go to Lake Huron, Mongolian Buffet, Meijer shopping. Deanne to dentist. Day 17 (Tuesday 21st) Bulk food picked up, firewood, worked on round pole model and frame. Sour dough wraps. Yoga, wanderlust movie and popcorn. Day 18 (Wednesday 22nd) Long morning recap. Beauty and Order, model, round pole, sadle joint. Foundation talk in evening. Day 19 (Thursday 23rd) Day off. CANDLEMAKING, pizza, Jared and Marcie visit for a PERMACULTURE walk about in the winter on this land, and dinner together. Day 20 (Friday 24th) Prepared for workshop, worked on round pole, cleaned places, shoveled, hardware and kroger shopping. Day 21 (Saturday 25th) ROCKET STOVE WORKSHOP. Puppy and Wendy and Ethan, pushed out of snow to get here. Made granola. Some Winterns went to a party in Detroit and stayed overnight there. Others stayed here. Day 22 (Sunday 26th) Day off. Jimez teaches DB to make body butter. Others went to ‘Toast’ for breakfast. Work notes, Rocket Stoves, to participant email and google docs. Day 23 (Monday 27th) 1 week planning meeting. Bringing round pole into house, photograph mushroom, brought in mushroom logs. FLOOR TALK. Earth Plaster demo. Modeling, rafter notching, bookshelf cleared in East Wing. DB to NCP meeting. Checked email. Day 24 (Tuesday 28th) Jessica T and db – office. Rafters on little model. Make flour paste, adhesion coat on E wing. LIQUID SOAP MAKING. Quinoa salad. Pm yoga and movie Ghost. Started soaking mushroom logs. Day 25 (Wednesday 29th) Dyes applied to bathroom floor. Sifting dirt, fiber sorting, green radio, garbage/recycle, interview. PLASTER TALK, Juggling, yogurt with Zack, cole slaw. NATURAL DYES, printed handouts. Day 26 (Thursday 30th) Applied Hemp Oil to bathroom floor and Strawbale Earthen Bench. Plastering East Wing. Stood logs on end. Day 28 (Saturday 1st) Day off, Jimez’s birthday! Lots of cooking–biscuits and mushroom gravy, cookies, bbq tofu. Vines, leaves, sconces started. Day 30 (Monday 3rd) Reviewed and continued thatching as a group–got it! Day 31 (Tuesday 4th) RETROFIT talk, hickory nut milk started, frame for light straw blocks. Cars stuck–got Michael out, drive plowed. Sponged down earth plaster, cleaned up space. Fixed stove. Day 32 (Wednesday 5th) More snow! Light straw blocks made, taught to re-tie strawbales. DESIGN talk. Experimented with MILK PAINT. Jimez sorted the worm compost. Prepared to leave, closing ceremony with candlelight in East Wing.